The Italians are refreshingly frank when it comes to food. Take gnocchi. These light, fluffy little fellows would probably be likened to a pillow or cloud by those old culinary romantics, the French. But the Italians? No, they prefer to call them, well what they are really - little lumps. 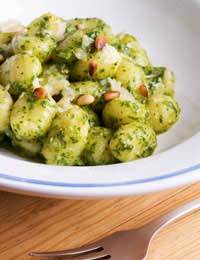 But don't let that put you off because when cooked correctly, gnocchi are light and delicious and perfect as a first course dressed with a simple tomato sauce, or even some melted butter, fresh sage and the ubiquitous grated coating of parmesan. The basic form of gnocchi involves a simple combination of potato and plain unbleached doppio zero flour. For four people, boil about 600 grams of potatoes and then whiz them up in a food processor. Then add to 150 grams of the flour to form smooth dough. The next step is to simply break off small amounts of the mixture and roll between the palms of your hands. Then run the prongs of a fork over the surface of each, creating grooves that will help the sauce to cling to it. Bring a large pan of boiling water to the surface and begin dropping the gnocchi in, preferably in small batches to avoid them sticking together. Inside the little lumps, the flour will begin cooking and when ready they will simply float to the surface where they can be collected with a slotted spoon. Variations on the basic recipe can involve sweet potato or squash. Gnocchi can also be made using eggs, ricotta, parmesan and spinach, the latter bringing an attractive marbled effect to the finished lumps. Again for four people, use two eggs, 150 grams of ricotta, 75 grams of plain flour, 400 grams of fresh spinach wilted in a pan and then squeezed tightly inside a dish towel to remove any excess water, 100 grams of parmesan and a little diced onion. The Romans are famous for a version of gnocchi that substitutes the flour for semolina which is mixed with boiling milk. Pour the milk along with half the butter and the salt into a large saucepan and bring to the boil. Add the semolina gradually, stirring with a wooden spoon, and then cook for around 30 minutes. Take the pan off the heat and add half the cheese, then pour the mixture onto a large baking tray and leave to cool. Using a small pastry cutter or the rim of a wine glass, cut the semolina mix into rounds and begin placing them, overlapping slightly, in an ovenproof dish. Preheat the oven to around 200 degrees, melt the rest of the butter and pour it over the gnocchi. Sprinkle over the remaining cheese and bake for around 15 minutes until a light crust has formed. Then serve with perhaps a few turns of the black pepper mill.